C-Plex, derived from ascorbic acid from which corn allergens have been removed, also contains bioflavonoids and is a perfect hypoallergenic choice for supplementation with the vitamin C complex. Flavonoids such as rutin and hesperidin as well as those from citrus sources frequently occur with vitamin C in nature, and appear to improve its bioavailability and complement its actions in the body. Flavonoids are useful in their own right as antioxidants and stabilizers of vascular permeability and capillary integrity. 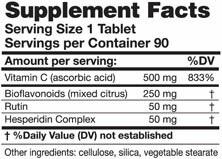 C-Plex includes generous amounts of flavonoids, unlike many other vitamin C complex formulas. 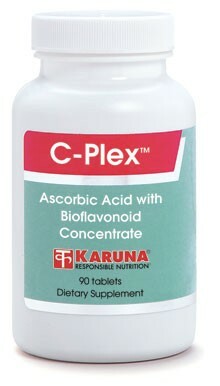 Bioflavonoids and vitamin C have been used in human studies to facilitate normal reparative activities in various body tissues (Med Times 1962;90:529-32; Med Times 1960;88: 313-314). Flavonoids such as rutin and hesperidin, often combined with vitamin C, support normal vascular permeability and healthy capillary integrity (Int Angiol 1994;13:259-62; Int Angiol 1993;12:69-72; Delaware State Med J 1959;Jan:19-22; Am J Med Sci 1946;211:539-43). Suggested use for adults: One or more tablets daily, or as directed.